All translations of the WQC papers must be lodged with the IQA before the event so we have them on record and can check against them if the need arises. We require sight of the paper(s) completed by any player who places in the top five worldwide in any one genre, and/or in the top 10 places overall. This is so we can check everything is in order before ratifying results. This may require us obtaining independent translations of players’ question papers. If after a reasonable time we have not seen and ratified results, whether individual genres or overall results, that person’s scores – and quite possibly all those from the same country – will have to be struck from the record. We are very saddened that this is necessary, but it is done with the best intentions and will help protect the integrity of the competition. Unfortunately, it will mean there will be a delay in getting confirmed results published, although we will publish provisional ones. The IQA would like to remind everyone taking part that this quiz is written and provided free of charge by the IQA in order to promote quiz as a competitive sport around the world and to enable you to take on the best quiz players globally. We allow local quiz organisations to run events around this and to use the event to generate funds for their own quiz activities. We do all of this in good faith and we expect participants to respect this and to act in good faith too. This sheaf of documents contains 120 questions, divided into 4 genres. It comprises Part I of the contest. Combined with Part II, your best 7 genre scores are aggregated to determine competition placing. Your lowest score will count only in the event of a tie. 1. You have 60 minutes to answer as many of these questions as possible. If you have finished before the expiry of 60 minutes, you may leave your seat. Please then respect the need for other players still quizzing to be free of distractions. Write your name on this sheet, and your name or initials on subsequent sheets. 2. The World Quizzing Championships is a test of your knowledge and so no research tools are to be used and there must be no conferring. 3. Papers will be swapped with another player for marking at the end of 60 minutes. Papers will be swapped again at the end of the second half. The marker this time should be different to the one who checked your work in the first half. 4. Unless stated in the question, last names will suffice. However, if you give the wrong forename, your answer will be incorrect! The icon Þ indicates that there is an image available at the end of the section related to the numbered question. The icon ♪♫♪ indicates that there is an audio segment related to the numbered question (Entertainment genre only). Answers should be written within the numbered space next to the text of question. 5. Phonetically correct answers will be accepted – this is a test of your knowledge NOT spelling. 6. After the four genres have been marked, you will get your paper back and you have 5 minutes to check you agree with the marking. Disputes must be referred to the proctor in this time. Please indicate which answer(s) you are querying with a large “?” question mark. The proctor is the official adjudicator for your site – their decision is final. 7. At the end of marking, your checker should copy your scores into the table on this sheet. If you agree with their marking, sign next to the score(s) to confirm this. Your complete script should then be handed in (it will be returned to you later). Once this has been done, no further discussions will be entered into about your score. The score signed for will be considered to be correct. 8. 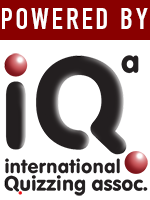 The overall highest scoring player from all participating venues will be the IQA’s World Quizzing Champion 2012, that of the best seven marks out of eight possible categories. 9. In the event of a tie, the score you dropped from your lowest scoring genre will be taken into consideration. If there is still a tie, the person with the highest scoring paper in any genre will win. If there is still a tie the player whose next best score (from any category) is highest (and so on) will be deemed the winner. 10. In the event of any unprecedented occurrence or unforeseen circumstances arising in the course of the quiz, the proctor may give a ruling on the matter and their decision shall be final. 11. Your commencing to answer questions herein indicates your complete and unequivocal acceptance of these rules. We hope you find the quiz both challenging and enjoyable. Good luck!